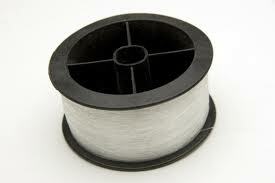 A Braided fishing line also known as a superline is much more common and has been used for decades. This type of line when knotted holds the knot. Its positive uses are that it is a powerful fishing line that does not stretch and will hold its own in power and strength. As good as this fishing line is the one drawback is that it is opaque in the water and the fish can visualize the line. Some anglers will knot a monofilament line to the end of a braded line, called the leader, in order to help make the line less visable to the fish. The braided fishing line can be used with baitcasing reels. This entry was posted on Wednesday, August 10th, 2011 at 9:45 am	and is filed under Baitcasting Reels, Fly Reels, Knot, Lures. You can follow any responses to this entry through the RSS 2.0 feed. You can skip to the end and leave a response. Pinging is currently not allowed.